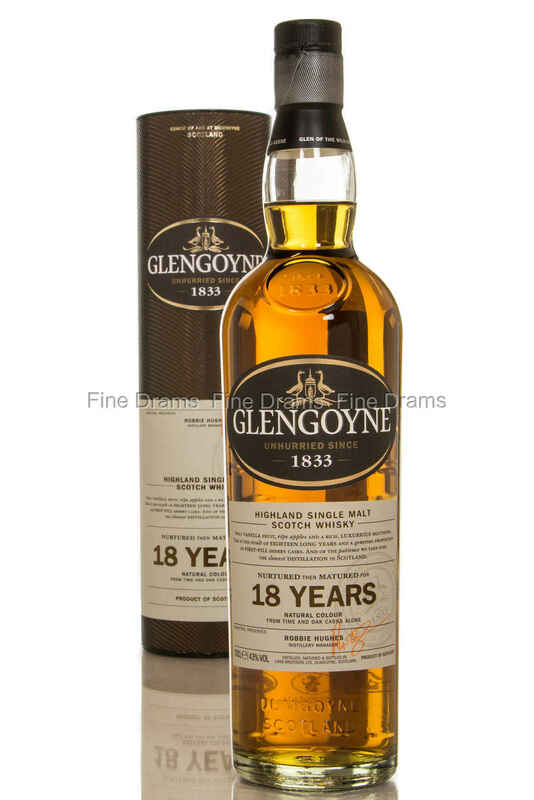 This Glengoyne has been carefully matured for 18 years, before being bottled at 43% with no artificial colouring added, creating a rich and decadent malt, with notes of creamy vanilla and ripe apples, and with a very creamy mouthfeel. Nose: Rum and cola is followed by slight nuts and some botanicals. Heavy sherry funk, with plenty of figs and prunes. More dried fruit comes through, followed by cinnamon and nutmeg. Palate: Faithful to the nose with more dried fruits, vanilla, rum and mashed bananas. Spice and cakiness on the back of the palate with slight floral and soapy notes. Slight cola and prunes. Finish: More cinnamon and nutmeg, with pepper and cream at the end. Overall: A fabulous dram, with powerful spice, fruit and sweetness. Handles its age very well, and is perfect for those yearning for a rich, yet nuanced whisky.